Best Saturday night out in Shoreditch. Abundance of good vibes to one of London's finest venues. 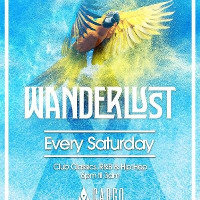 We’re delighted to present new Saturday night party in Cargo - Wanderlust. Best club experience in Shoreditch from 6pm - 3am with 2 different rooms - Tropical House, Commercial, RnB & Hip-Hop We'll be bringing an abundance of good vibes to one of London's finest venues in the heart of Shoreditch. BIRTHDAYS & LARGE GROUPS: Email us on reservations@sbg-london.com for special deals to table reservations. Arrive early or get ready to wait your turn - the door can be difficult depending on the amount of people waiting to get in. Strict door policy with ID scanner, please have ID with you to avoid difficulties - strictly over 18's. Big groups - we operate on 50/50 female/male policy.